Made from high-quality, 304, food-grade steel, or 316 grade for lab use – which complies with all current Health & Safety and Food Hygiene regulations – they are super-tough, heat-resistant and exceedingly durable. These qualities make them suitable for all applications, from the preparation and serving of food in commercial and domestic kitchens, to the storage and dispensing of medication in healthcare facilities and veterinary surgeries. 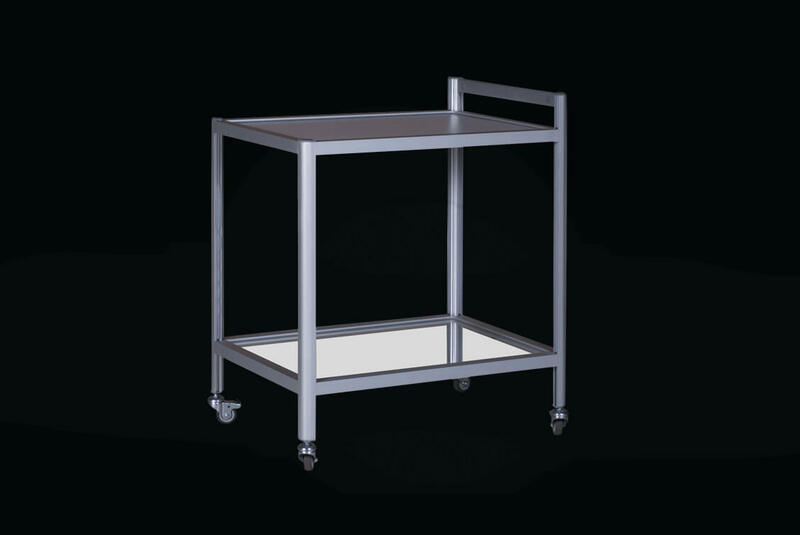 We also offer trolleys made from premium, 316-grade steel, for laboratory purposes. All of our trolleys are fabricated to order in our Nottingham factory. This allows for full customisation, so that the units can be made to virtually any size and shape. They can also be fitted with a variety of feet and castors. For a truly versatile unit, order a piece featuring an integral stainless steel worktops, to provide a mobile work surface/table top. With the addition of locking castors, the trolley will double as a stable piece of furniture – ideal where space is limited, or where versatility is paramount. Our stainless-steel laboratory trolleys are functional and hard-wearing. Made from premium, 316-grade metal – which is resistant to corrosive chemicals as well as extremes of heat – these bespoke items feature inbuilt antibacterial qualities, which make them an ideal choice for a lab environment. locks can be fitted to doors and drawers. Our trolleys are just one area in our range of world-class, lab-specified, stainless-steel products. We have many years’ experience in fabricating entire laboratories to order, including worktops, cupboards, shelving, fume cupboard liners, laboratory sinks and splashbacks. Contact us today, to find out how we can supply the products you need for your project. Boasting naturally antibacterial properties, stainless steel is the ideal material to help maintain the supreme hygiene standards demanded of a hospital, clinic, dental practice or care home. Our trolleys for the healthcare sector are fabricated from high-quality, 304-grade stainless steel, which meets all current Health & Safety and Food Hygiene regulations. They are not only easy to keep clean but are also supremely robust and durable. Whether you need a mobile unit for the dispensing of medication, the distribution of food, or for the laying out of instruments in surgery, our stainless-steel trolleys can be adapted to the application. locks on cupboards and drawers, to keep medication and/or instruments safely out of reach. At DSM, we have more than fifty years’ experience of supplying stainless-steel products to the healthcare sector. Among many other items, we offer: worktops, shower trays, sinks, splashbacks and hand-wash basins. Thanks to our bespoke factory set-up, we can fabricate any item you need for your institution or project, including laboratory-grade products. Contact us today, to find out how we can supply the products you require. Our stainless-steel trolleys are the ideal solution for areas in any academic institution where a versatile piece of furniture is required. With the inclusion of a fully-welded worktop, the trolley can double as a food-preparation surface for a kitchen or food technology room, or even as a table/desk top in a classroom or nursery. Choose locking castors, for a really solid piece of furniture that can nonetheless be moved easily when required. Where extra storage is needed, opt for built-in shelves, drawers or cupboards. We can fabricate the trolley to any shape and size, with a wide choice of feet and castors, to meet your exact specifications. As with all of our bespoke products, our trolleys are made using high-quality, food-grade steel, which meets all current Health & Safety and Food Hygiene regulations and is so robust and impact-resistant, it will last for decades. It is also the sound choice from an environmental perspective, as the raw sheet comprises around sixty per cent recycled materials and the end product is fully recyclable. We offer a wide range of other items for use in academic institutions. Choose from: worktops, splashbacks, hand-wash basins, vanity tops, urinals, cupboards and shelves. All of our products are resistant to impact and extremes of heat. For laboratories, we fabricate all products from premium, 316-grade metal, which is also resistant to harsh chemicals. Get in touch today, to discuss your requirements. Fabricated from 304, food-grade steel – which complies with all current Food Hygiene and Health & Safety regulations – our stainless-steel trolleys offer all the stability of a solid table, with the option of castors for mobility. Each item is bespoke, to fit the end-usage – whether you need a wheeled unit for distribution purposes or a mobile storage facility. For a truly versatile piece, opt for an integral work surface plus locking castors, for a stable surface that can still be moved when required. This offers the luxury of an additional work space that can be placed where needed, yet can still function as a trolley. optional, built-in storage: shelving, drawers and/or cupboards – with optional locks on doors and drawers. At DSM, we have many decades’ experience of supplying to the catering industry. From whole kitchens to single items, we can provide the exact product/s you require, for your commercial kitchen. These include worktops, hand-wash basins, sink units, splashbacks, cupboards and shelving. Get in touch today, to find out how we can fabricate the products you need. Entirely bespoke, our attractive, stainless-steel trolleys are a versatile addition to your home. The gleaming surface will need little more than a regular wipe with a cleaning cloth, to retain its stunning sheen. Fabricated in our Nottingham factory to your exact specifications, your trolley will be unique. Simply choose the shape and size of unit you require, to complement your scheme. Add built-in cupboards, drawers or shelving, for additional storage. Choose from a variety of feet or castors – or opt for locking castors, for a mobile unit that doubles as a solid item of furniture when locked. For a truly versatile unit, add an integral worktop, for an extra surface on which to work or prepare food. As with all of our bespoke items, our trolleys are made from high-quality, environmentally-friendly stainless steel: the raw sheet comprises around sixty per cent recycled materials, and the end product is fully recyclable. Take a look at our other contemporary items for the home, including worktops, shower trays, splashbacks, kitchen cupboards, shelving, hand-wash basins and sinks. Or get in touch today, to discuss your interior design plans. Our stainless-steel veterinary trolleys are highly adaptable, to fit the end usage. Whether you need a movable storage facility or a solid piece of additional workspace, we can fabricate the exact item, to your specifications. standard, 304-grade metal or 316-grade (laboratory-grade), for areas where harsh chemicals are handled. Super-strong, impact-resistant and supremely durable, our trolleys are the economically-sound choice for your veterinary practice, as they will last for decades. DSM’s range of other items for veterinary clinics all meets the same high specifications. We can supply worktops, shower trays, sinks, hand-wash basins, cupboards and shelving, all to your exact requirements, to fit the application and situation. Contact us today, to discuss the products you need for your practice.